In the name of Jesus and by the authority of God’s Word I no longer see myself as natural. I see myself the way God sees me, I am highly favoured and crowned with glory and honour. I take authority over condemnation, guilt, depression, shame and inferiority and I break any negative hold over me in Jesus mighty name! I declare in faith that I walk in favour; I have preferential treatment. I refuse to allow condemnation in my life. From this moment onward, my self-esteem and self-image shall rise in accordance with God’s word. I will not be high-minded rather I walk in humility. But I know who I am in Christ and I fully expect to receive the treatment given to those who are highly favoured. This is the day that the Lord has made, I will rejoice and be glad in it. Doors will be opened to me that men say are impossible to open. Today, this very day, I expect the favour of God to go before me in Jesus mighty name! I am in Christ , God my Father honours me, and I am special to Him. I am the object of His affection. And if God loves me, nothing can separate me from His love. 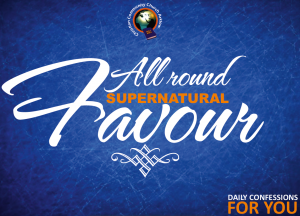 I am favoured of the Lord in my career, relationships, business, academics and family life in Jesus name. I have all round favour with the Almighty God and people. It’s my turn to enjoy mercy and grace, therefore good things are going to happen to me and I will be and agent of God’s goodness to others. I see myself fruitful and fulfilled in Jesus name! Amen. Download your prayer card here!